Our thanks to all of you who completed the member survey last September. This is the third BANT Annual Member Survey aimed at giving you a say in how your professional body can be of maximum benefit to you. A full article outlining the survey results will be published in February’s newsletter but we wanted to give you a snapshot of your responses here! In 2016, we had a 2% greater response rate from the 2015 survey and respondents showed a higher level of awareness and engagement with BANT, which is really positive. We want to build on this in 2017 to ensure all members feel supported in their training and practice. Final Reminder – The BANT 2017 online membership renewal process is now open and you have until 31st January 2017 to renew your membership. If you missed the membership renewal notice and would like to be reminded why it is so essential to renew your membership click here. Reminder 3 – The BANT 2017 online membership renewal process is now open and you have until 31st January 2017 to renew your membership. If you missed the membership renewal notice and would like to be reminded why it is so essential to renew your membership click here. Welcome to the January edition of the BANT ENews. January has already started with a bang with the launch on 4th January of our Detox4You poster and we are starting as we mean to go on here at BANT ENews with a bumper edition filled with useful information for you and your practice. In this month’s feature article, Angela Walker has investigated and compared water filter methods; our book review features Packed, a book full of breakfast and lunch recipes for packed meals, co-authored by one of our members Michelle Lake, along with food writer, Becky Alexander. Go to our Website Focus article for a spotlight on where to find our growing family of BANT Toolkits on our website and don’t forget to look at the membership feature for a reminder on how to renew. Enjoy!! Access the BANT news here. Welcome to the January edition of the BANT ENews. January has already started with a bang with the launch on 4th January of our Detox4You poster and we are starting as we mean to go on here at BANT ENews with a bumper edition filled with useful information for you and your practice. In this month’s feature article, Angela Walker has investigated and compared water filter methods; our book review features Packed, a book full of breakfast and lunch recipes for packed meals, co-authored by one of our members Michelle Lake, along with food writer, Becky Alexander. Go to our Website Focus article for a spotlight on where to find our growing family of BANT Toolkits on our website and don’t forget to look at the membership feature for a reminder on how to renew. Enjoy!! In our bulletin this fortnight, get organised for the months ahead with some suggestions for events and seminars by the Student Network Team, follow a link to the latest Functional Forum on YouTube and a reminder of the next BANT student webinar on 24th January. Lamberts give regular Practitioner Seminars by well-known speakers such as Marilyn Glenville and Lorraine Nicolle. At about £37.50 each, they are ideal for strapped students. Plus, the seminars are taking place around the country from Edinburgh to Brighton making it easier for us all to benefit. In the ‘Female Hormones’ seminar, Lorraine Nicolle will be guiding us on how to identify female hormone imbalances by identifying and supporting the most influential biochemical pathways. Also, the ‘Autoimmune Conditions’ seminar proves to be an interesting and useful day. The brilliant and humorous Shoela Detsois will be discussing the genetic susceptibilities, environmental triggers and biochemical mediators that drive autoimmunity, and how to support them with diet and supplementation. Here is the link to the list of venues and seminar topics. To view it you may need to register with Lamberts if you haven’t already. Genova Diagnostics give extremely valuable talks on a range of their tests that help deepen insight and understanding on how to use them to enhance our clinical practice. On Thursday 7th February, Jo Gamble will evaluate the biomarkers used in the GI Effects stool test, a really useful test we will probably be relying on a good deal in clinic, so it’s worth getting ahead. She will unpick and explain the various biomarkers involved and will use case studies to help demonstrate their clinical relevance. Click here to book. Tickets cost £99. The seminar is from 9.30am until 4.30pm, at Kensington Close Hotel, W8 5SP. CAM Conferences are extremely well attended for good reason: they draw speakers at the top of their profession who offer the most up-to-date insight into their specialism. The chance to mingle and network with other Nutritional Therapists and students is extremely valuable, as is the opportunity to try out new products at the stands during breaks. The gluten-free buffet lunch is included and is always pretty scrumptious. Plus, there’s a free goodie bag. Topics this year include ‘Nutrients and gene expression’, ‘Antioxidants’, ‘Autoimmunity’, ‘Functional Sports Medicine’, ‘Gut health’ and ‘Ageing’. Frankly, they all sound indispensable. Each seminar costs £95, but book before 10th February for the early bird price of £86. There are discounts, too. BANT members get 15% off while students get 10%. Click here for the booking form. The Functional Forum was set up by James Maskell, author of the brilliant book ‘The Evolution of Medicine’. It’s a monthly conference for Functional Medicine practitioners around the world to tune in to learn the latest news, research, health technology and practise development. It’s a modern delivery and engaging to watch, and there’s usually a topic – this month’s was Mental Health. For the first time the forum was held in London, at the Royal Society of Medicine. James Maskell is working hard to bring positive change to modern healthcare for both physicians and patients. We are not trainee primary care physicians, but it will be valuable for our practise as Registered Nutritional Therapists to have a good understanding of the strengths and weaknesses of the healthcare system. Here is the link to watch this month’s forum on YouTube. Don’t forget the next BANT student webinar is on Tuesday 24th January at 7pm. Joy Skipper will be discussing what to consider once our courses are over. For those of us in our final years of studying, it will be a helpful look ahead to life after our studies. It’s not too late to register: email studentwebinars@bant.org.uk. The British Association for Applied Nutrition and Nutritional Therapy (BANT) will be watching tonight’s Horizon: Clean Eating — the Dirty Truth (BBC Two at 9pm) programme with interest. BANT has previously highlighted its concern about the growing number of ‘insta-nutritionists’ who have done short online courses, healthy eating bloggers, YouTubers and healthy eating recipe book writers, who advocate radical ‘one-size fits all’ eating regimes which are not evidence based. Whilst pretty pictures of colourful foods are a lot of fun, ultimately nutrition health advice is something you should only trust real professionals with. BANT Registered Nutritional Therapists take into account individuality that enables personalisation of dietary advice based on the most up-to-date research available. BANT experts carefully developed a set of Wellbeing Guidelines, based on the latest science and research in the field of nutrition for optimal health. The BANT Wellbeing Guidelines were specifically designed to provide clear, concise, easy to understand information for the general public, avoiding out-dated information and research, and addressing some of the most common health concerns. 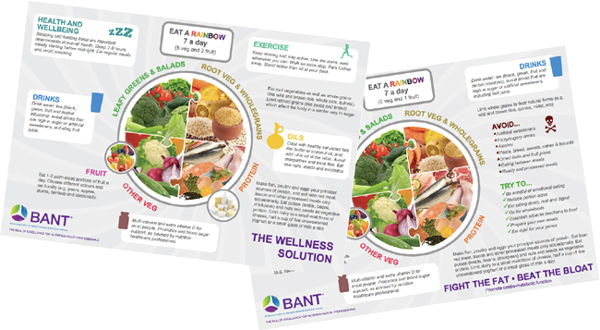 The aim of the BANT Wellbeing Guidelines is to provide detailed guidance in a simple format to help people make the best choices in both nutrition and other aspects of a healthy lifestyle. The Wellbeing Guidelines give clear information, not just on food choices but also crucial lifestyle factors which are over-looked in other health guidelines. BANT developed the Wellbeing Guidelines as a response to current health concerns using the latest evidence – drawing on the strengths of existing public health guidelines but providing updated guidance. To see a copy of our Wellbeing Guidelines, click here. BANT, The British Association for Applied Nutrition and Nutritional Therapy, recommends that you choose a Registered Nutritional Therapist who has undertaken training at an accredited course thereby ensuring necessary training to understand the theory and practice of nutritional therapy. BANT-member Registered Nutritional Therapists are regulated by the Complementary and Natural Healthcare Council (CNHC). The CNHC holds an Accredited Voluntary Register (AVR) for the Professional Standards Authority for Health and Social Care (PSA). The PSA oversees statutory bodies and accredits organisations holding voluntary registers for health and social care occupations in the UK. By choosing Registered Nutritional Therapist, registered with the CNHC, you can be confident that they are properly trained, qualified and insured. Looking for a BANT Registered Nutritional Therapist is easy; just click on the link for a full listing of our Registered Nutritional Therapists area by area: http://bant.org.uk/bant/jsp/practitionerSearch.faces. The British Association for Applied Nutrition and Nutritional Therapy (BANT) is the professional body for Registered Nutritional Therapists. Its primary function is to assist its members in attaining the highest standards of integrity, knowledge, competence and professional practice, in order to protect the client’s interests; nutritional therapy and the registered nutritional therapist. Registered Nutritional Therapists are recognised by the Professional Standards Authority (PSA) in their ability to make a difference by working together with healthcare providers as part of multidisciplinary teams under NHS commissioning. This is your chance to have your questions answered at the BANT AGM 2017. The BANT AGM is approaching and we look forward to providing you with an update of 2016 events and 2017 focus along with insight into our new 5 year plan. The purpose of BANT is first and foremost to benefit its members and to improve the professional status of Nutritional Therapy. To ensure that your questions on any related topics are answered, we invite you to send them to us in advance of the day so that we can collate them and answer them during the presentations and the Q&A. Reminder 2 – The BANT 2017 online membership renewal process is now open and you have until 31st January 2017 to renew your membership. If you missed the membership renewal notice and would like to be reminded why it is so essential to renew your membership click here. Reminder 1 – The BANT 2017 online membership renewal process is now open and you have until 31st January 2017 to renew your membership. If you missed the membership renewal notice and would like to be reminded why it is so essential to renew your membership click here.